* Supports 3,469 devices and growing. o Microcontroller: AMD, ATMEL, AVR, DALLAS, INTEL, ISSI, LGS, MICROCHIP PIC, PHLIPS, SIEMENS, SST,TEMIC, WINBOND, WSI, ZILOG etc. o PLD: AMD, LATTICE, ATMEL, CYPRESS, NSC, ST, ICT etc. * Self diagnostic test at startup and Over current protection built in. * Available package adapters: PLCC, QFP, TSOP,SOIC, SOP, SSOP etc. * Connect to PC (desktop and notebook) via printer port. * Auto generation of electronic serial number in chips. * User editable BATCH function. * Powerful buffer management and edit function. * Auto recognition of file format. * TTL/CMOS test and auto find. * Are you looking for a new device update support in the future? Please check on Superpro 3000U programmer. Customer requested device update service is not available on this model. * Programmer is warranted to be free of manufacturing or workmanship defects for one year from the date of purchase. Online Technical Support is also available 24 hours or you may call us during our business hours through Friday 8:30am to 5:30pm (PST). 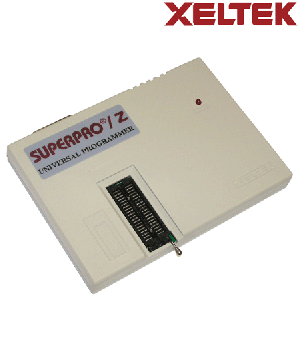 * SuperproZ and SuperproLX programmers are entry level low-cost models, which do not have internal processing capability. It relies on the PC host CPU and memory for programming and other functions. As such, there may be some timing variations caused depending on PC CPU and operating system used. As a result, some later devices which are timing sensitive may be affected in their programming performance. Also, due to it's limited hardware architecture, inconsistent operation may occur with some models of later WinXP systems. When this occurs, we recommend you to try on a lower speed system and when this does not solve the issue, contact us for upgrade to one of the later USB models. Currently, Xeltek Inc is giving up to %50 discounts if you are willing to buy 10 or more..! Street Address: 1296 Kifer Rd.